and so many other leaves recognized for being wiltable in a frying pan run rampant in a final seasonal hurrah, overlapping with new green food, like sweet peas and fava beans. There are also the foods that urban dwellers rarely meet in their green baby stage—like almonds and chickpeas. Most people wait for them to be picked, dried and packaged. 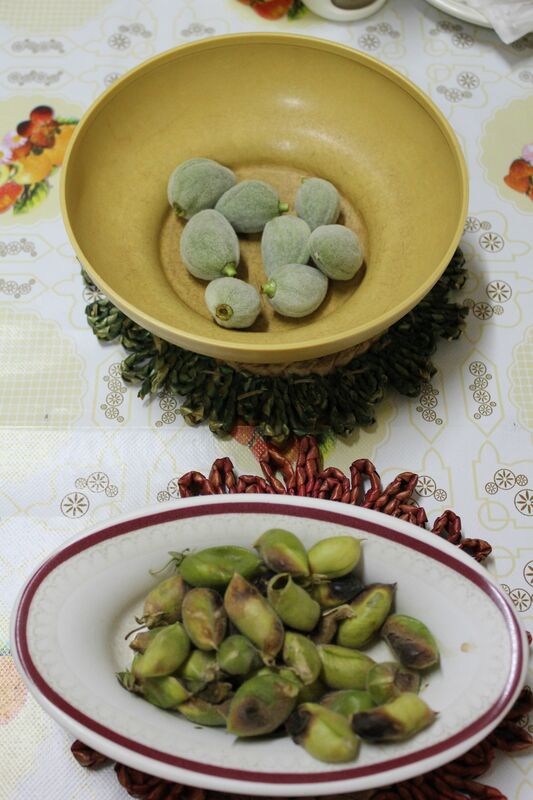 But in Jordan, where I’m writing now under an almond tree, and Lebanon, Sryia, Egpt and Palestine, these almonds and chickpeas are coveted for the short season before they become vegans’ best friends. Green almonds are picked and dunked in course salt and munched on, more for the crunchy, juicy freshness than for being particularly flavorful. Green chickpea pods, each yielding one or two peas, are roasted and then the soft, warm chickpea is popped out with the same principle as cracking open roasted peanuts in the shell. This spring in Jordan the landscape is super green, thanks to a brutally rainy and snowy winter. A punster could have fun playing with the word Arab Spring at this point. But that phrase only makes people cringe. Jordan has long been a landing spot for displaced Palestinians or a temporary escape route for wealthy Lebanese caught in the country’s civil war. Today Jordan is a dumping ground for human tragedy—refugees from nearly all its border points—both rich and poor from Syria, Iraq, and Palestine. It is also a country where many of the gardeners picking spring’s green things are Egyptians. The gardener next door just returned with from visiting his family outside Cairo. Between giving me various medical and culinary suggestions for rosemary, so that the herb’s overgrowth will not be wasted, he lamented the ruin his country is in. I don’t actually know his politics but that is not as important as the sorrow that comes over everyone with whom you talk. Once sustainable societies that survived, albeit poorly, off the produce of their lands have been floundering between stupor and rage in a diet fueled by junk food politics nearly a century in the making. This spring, the violent crash diet approach to change is horrifying to watch. It takes a long time for the region’s beloved olive tree to grow in strength and power and be fruitful. The little olives are just popping out green now. There’s something to be learned from the land. And there’s some comfort in knowing that a predictable cycle of life at least hasn’t been too disturbed in the garden…but even that’s not so true when you think of what warfare does to the land. Hameli means “pregnant” or “full.” Rinse the green pods off and dry. Place single layer on baking sheet and toast until the pods char slightly, stirring occasionally. (A small amount can even be done in a toaster oven).